At the public hearing this morning, the Board voted 4-0 to approve the resolution. According to Transportation Director Perez, the road is expected to cost “in the neighborhood of about $8 million”, the cost of which will be “borne by private development”. On January 13, 2015, the Riverside County Board of Supervisors will hold a “Public Hearing on Adoption of Resolution No. 2015-002, Authorization to Adopt a Resolution of Necessity for the Street A Improvement Project”. According to the agenda, the meeting begins at 9:00 AM. The hearing is agenda item 9-2. The Street A Project is a proposed two lane collector road connecting McAllister Parkway to Van Buren Boulevard, of which 40 percent is located within the jurisdiction of the County of Riverside (County) and 60 percent is located within the jurisdiction of the City of Riverside (City). In 2006, the County approved Tract 30153 (McAllister Hills), which would have constructed a golf course residential community development. 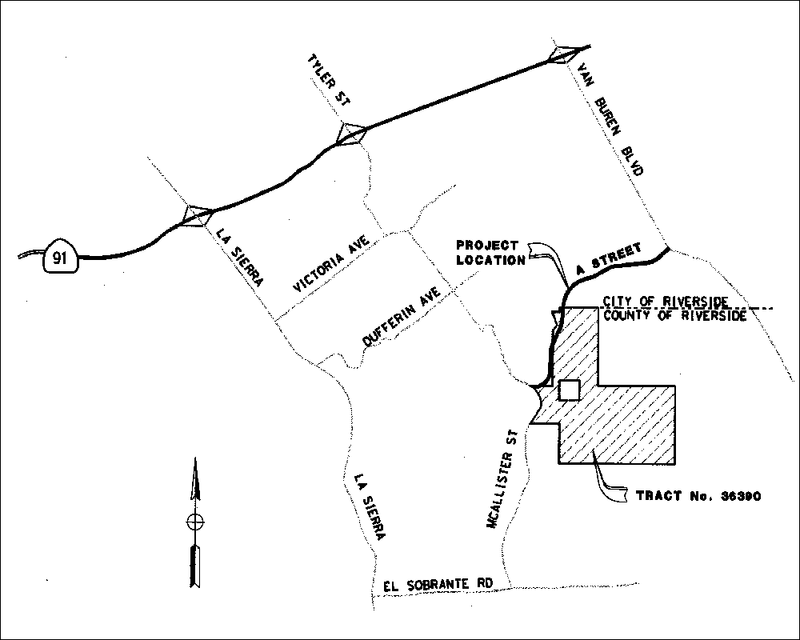 The County required this tract to construct a new road between McAllister Street and Van Buren Boulevard, referred to as Street A, which would serve traffic from the development and provide an alternate access route for residents of Victoria Grove, The Orchards, and other communities in the area north of El Sobrante and east of La Sierra Avenue. The road design was nearly complete and right-of-way was about to commence in 2008 when work ceased on the developer’s project, which went into foreclosure due to the economic downturn. Since that time, the community desires to see Street A move forward ahead of development due to the closure of the extension of McAllister north into the City of Riverside, which was done by the City in 2009. The Project is a critical circulation and emergency access link for the communities of The Orchard, Victoria Grove and other developments located east of La Sierra Avenue, and north of El Sobrante. The Economic Development Agency/Facilities Management (EDA/FM) has presented written offers to the property owners as required by Government Code Section 7267.2. The amount of the offers is consistent with current property values in the Woodcrest area and is based upon a fair market value appraisal report. All costs associated with the acquisition of these properties are fully funded by Developer Contributions in the Transportation Department’s budget for FY 2014/15. No net county costs will be incurred as a result of this transaction. La Sierra is already a mess from commuters using it as a Van Buren bypass. This will surely make it worse. Thanks. Who uses La Sierra to bypass Van Buren? Unless you like going 15 miles out of your way to get around a little bit of congestion, I find it hard to believe anyone would do that. If anything this will alleviate some of the backup at the bottom of the hill by giving residents up by the lake another way to get into town. Funneling everyone who lives in Lake Hills, Victoria Grove and the surrounding areas onto just one road has never made sense and this should have been done a long time ago. This street will alleviate the painful traffic on La Sierra for sure. It will be built – I just hope it gets done sooner than later. Most of the added traffic on La Sierra between Blackburn and Indiana is from vehicles coming from / going to El Sobrante Rd and then on to Cajalco. Do your own due diligence as I have and you will see this to be a reality however; this road is the least of the worries for La Sierra. Vehicles from Citrus Heights and the 4 other planned developments along McAllister and El Sobrante are going to make La Sierra as miserable as the 91. THANKS CITY OF RIVERSIDE. IT’S CLEAR YOU ONLY CARE ABOUT PROPERTY TAX DOLLARS.